Space Investigator™ is a modified version of the popular program WinDirStat that is redesigned to provide integration with AB Commander. 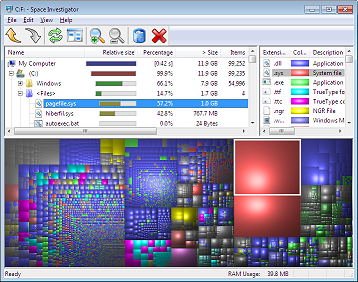 Space Investigator makes it easy to analyze the sizes of the files and folders on your computer. Space Investigator presents this information in a visual way, making it effortless to see which files and folders take up the most space. If the hard drive of your computer is filled close to its capacity, you can run Space Investigator to find the hogs that consume the space of your hard drive and delete them. What does Space Investigator do? When you run Space Investigator, it analyzes the hard drives you've selected and displays the result in a visual manner in its window. The left-hand area of the window shows the folders and files your hard drive contains, sorted by size, indicating the relative size of each item in a separate column. The right-hand area contains the list of the file types that exist on your hard drive, with the legend of the colors assigned to each type for easy identification. Finally, the bottom part of the window displays the information in a visual manner: each square drawn there represents a file (with the size of the square approximately proportional to the size of the file), and the boxes representing files of the same type are drawn in the same color. This makes it easy to locate the large files that take up the space on your hard drive. As you move the mouse over the bottom part of the window, the path of the file corresponding to the square under the mouse pointer is displayed in the status bar of the window. If you click on a box, Space Investigator locates the file it represents in the upper parts of the window and selects it there. You can use Space Investigator and AB Commander together: If you want to take a closer look at the selected file or the folder where it's located, you can press the AB Commander icon on the toolbar of Space Investigator, and that should open AB Commander for that folder. (If the AB Commander window is already open, it should navigate to that folder automatically for you). Alternatively, while browsing your hard drive with AB Commander,you can press the Space Investigator icon in its toolbar, and that should start Space Investigator for the active folder of AB Commander. If you've recognized that the file you've selected in Space Investigator is no longer needed, you can move it to Windows Recycle Bin, or delete it at once, by pressing the appropriate buttons on the toolbar. You can also define your own cleanup actions, to be used with the selected files, by using the File - Preferences - Cleanups command of Space Investigator. (For example, you can create an action that would launch a file shredder that you have to destroy the contents of the file before deleting it). How to get Space Investigator? Space Investigator is available to the licensed customers of AB Commander, free of charge. If you are using AB Commander 7.5.5 or later, you can press the Space Investigator button on its toolbar, and it should prompt you to download and install Space Investigator automatically. If your version of AB Commander is older than 7.5.5, you can download Space Investigator manually, after entering your AB Commander license key. Keep in mind, however, that versions of AB Commander prior to 7.5.5 are not integrated with Space Investigator. To get full advantage of the integration between AB Commander and Space Investigator, it's recommended to upgrade to the latest version of AB Commander. If you have not purchased an AB Commander license yet, you can purchase it now and get two products, AB Commander and Space Investigator, for one price! What are the system requirements to use Space Investigator?